Deut.30:19 I call heaven and earth to record this day against you, that I have set before you life and death, blessing and cursing: therefore choose life, that both thou and thy seed may live. The statement not only speaks of God being the only way, but it also speaks of the strength or power that you have; whether to take the right path or the wrong path. Gen.2:16-17 And the Lord God commanded the man, saying, Of every tree of the garden thou latest freely eat: But of the tree of the knowledge of good and evil, thou shalt not eat of it: for in the day that thou greatest thereof thou shalt surely die. Gen.4:7 If thou doest well, shalt thou not be accepted? and if thou diets not well, sin lieth at the door. And unto them shall be his desire, and thou shalt rule over him. Josh.24:15 And if it seem evil unto you to serve the Lord, choose you this day whom he will serve; whether the gods which your father’s served that were on the other side of the flood, or the gods of the Amorites, in whose land he dwell: but as for me and my house, we will serve the Lord. 1 Kings 18:21 And Elijah came unto all the people, and said, How long halt he between two opinions? if the Lord be GOD, follow him: but if Baal, then follow him. And the people answered him not a word. 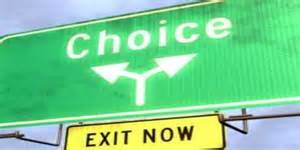 The Bible is full instances of individuals given choices to make–some made the right choice and others disobeyed, thereby making the wrong choice. King Saul and Naaman are examples of this, to name a few. We at times get comfortable in our place and in our space. We just don’t want to get too involved; no commitments, no responsibilities. How close do you want to get to God? How far are you from Him? Do you want to move ahead or live on the past? What it all amounted to was compromise. How much of God do you want? Is your way more important than His? This speaks of one of the ministries of the priests–they were to teach the people. Note what it is that we are to learn–the difference between what is holy and what is not. Do I know the difference? If not, am I learning the difference? If so, am I walking in it? There is a difference between what is holy and what is not, and I am required to know that difference is and live by it. How important is holiness to you? If in all of these areas, I am not all I should be (and none of us really are), my position in Christ is not altered, but my condition will fluctuate. There will be bouts of dissatisfaction, misery, emptiness, lack of fulfillment, and even depression. As a Christian, until I am giving Him my best and my all, and putting Him first, there will be no peace…still saved, but no peace. The only right choice is to live His way, trust Him and commit myself to Him.